Few online storage solutions meet customers’ data demands as well as MyPCBackup. 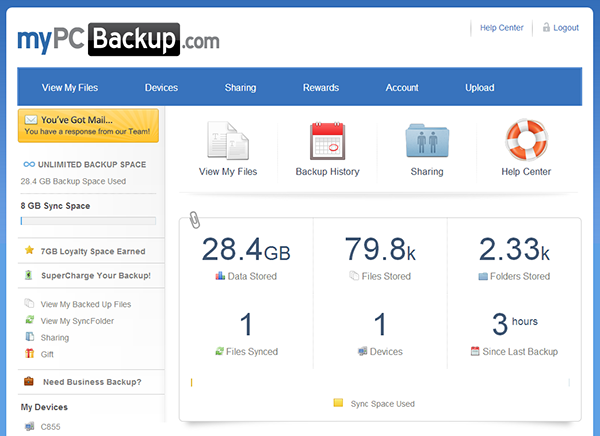 The company is a trusted name online backup game, offering an array of features that help distinguish MyPCBackup from the competition. MyPCBackup employs an intuitive desktop application to seamlessly handle the once-complicated task of backing up your computer data, making those documents easily accessible via PC, laptop, smartphone or tablet. MyPCBackup handles backup tasks in a surprisingly graceful and intuitive fashion. The desktop application makes backups as straightforward as can be thanks to a handy drag-and-drop feature. Simply highlight the files and folders you want backed up and move them to the drag-and-drop folder to begin the backup process. You can ensure the availability of your documents across multiple computers through the MyPCBackup Sync folder. Install the desktop application on any computer that you would like to give file access to and the Sync folder will automatically update the folder with documents that have been previously backed up. There is also no file type limitation, so any file, document or executable that resides on your computer can be backed up, synced and accessed using a wide array of devices. MyPCBackup takes their users’ security and privacy very seriously, utilizing Google’s Cloud Storage servers across multiple data centers around the world to ensure the availability, integrity and security of your data. Safely replicating your documents across several data centers is a foolproof approach to keeping your data accessible in the highly unlikely event of a data loss issue at one or more storage centers. Furthermore, the implementation of a 256-bit Advanced Encryption Standard (AES) means that every document, photo, video or other file type that you back up, sync or restore using MyPCBackup has gone through a high level of encryption. This level of encryption safeguards your data while being transferred between your computer, cell phone or other device, and JustCloud’s secured data centers. MyPCBackup’s security measures demonstrate the company’s willingness to go above and beyond to assure users with any potential security concerns. Even the easiest-to-use applications can sometimes leave users scratching their heads. Questions about data backup, restoring, billing, file sharing, syncing and others may necessitate the need to use MyPCBackUp’s support system. Users have a very useful resource in the extensive FAQ section, which elaborates on topics relating to your MyPCBackup experience. Video tutorials are also available from their website and provide visual assistance for many common tasks. Additionally, MyPCBackup provides personal assistance via email support 24/7 a day, 365 days a year. MyPCBackup’s versatility truly shines by providing access to a multitude of devices and operating systems from anywhere in the world. Chief among these features is MyPCBackup’s sharing capability, which allows any backed up or synced file to be easily shared by sending a download invitation through email, Facebook or Twitter. Any file or document that you back up can be accessed using a laptop, PC, smartphone or tablet—wherever Internet access is available. The comprehensive list of supported operating systems, available apps for various devices and MyPCBackup’s mobile browser help facilitate a secure, convenient and accessible storage experience. MyPCBackup allows you to access previous versions of your files for up to seven days through versioning. Ability to back up audio files in your iTunes library and archived emails in Microsoft Outlook. Share files and folders with friends and family by using MyPCBackup’s share feature, which allows you to enter an email address and send a message to your intended recipient. MyPCBackup offers different plans that vary depending on your storage demands. The following pricing is based on their two-year plans. As online storage demands increase, it has become increasingly clear that backing up data on DVDs and external hard drives is not only unnecessary, but impractical. MyPCBackup has garnered positive attention because they incorporate all of the necessary assets that you need to protect your data: security, usability and accessibility. Users of virtually any skill level can now perform the critical task of protecting their data indefinitely thanks to MyPCBackup’s data storage solution.